Switches on the auxiliary heater. Switches off the auxiliary heater. Pressing the button in the remote control can switch on the auxiliary heater unintentionally. This also applies if you are outside the effective range of the control or the indicator lamp is flashing. Lights up green for approximately 2 seconds. The auxiliary heater has been switched on with . Lights up red for approximately 2 seconds. The auxiliary heater has been switched off with . Flashes green slowly for approximately 2 seconds (around four times per second). The signal to switch on has not been received a). Flashes green rapidly for approximately 2 seconds (around ten times per second). The auxiliary heater is blocked. Possible reasons: the fuel tank is nearly empty, the vehicle battery is weak or there is a fault. Flashes red for approximately 2 seconds (around four times per second). The signal to switch off has not been received a). Lights up orange for approximately 2 seconds, then turns green/red. The battery in the remote control is weak. However, the switch on/off signal has still been received. Lights up orange for approximately 2 seconds, then turns green/red. The battery in the remote control is weak. The switch on/off signal has not been received. Flashes orange for approximately 5 seconds. The battery in the remote control is discharged. The switch on/off signal has not been received. 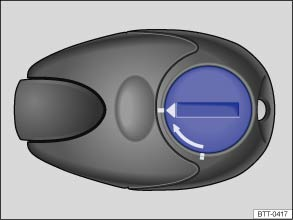 If the indicator lamp in the remote control flashes orange for approximately 5 seconds when the button is pressed, or does not light up, the battery in the remote control must be replaced. 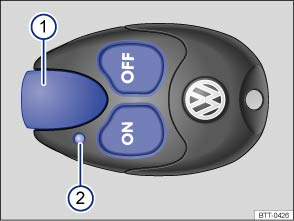 The battery is located on the rear side of the remote control underneath a cover. To open the cover, use a flat object (e.g. a coin) to turn the slot against the direction of the arrow to the mark . Fit new battery. When changing the batteries, ensure that they are inserted correctly (poles) and that they are the same type . Fit the battery cover and turn in the direction of the arrow until it reaches the mark indicating its starting position. The receiver is located in the vehicle interior. The remote control key has a range of several hundred metres when the battery is fully charged. The range of the remote control key can be considerably reduced by obstacles between the remote control key and the vehicle, bad weather conditions, and a flat battery. To achieve optimal range, hold the remote control vertically with the aerial at the top. Do not hold the aerial with your fingers or the palm of your hand. The distance between the remote control and the vehicle must be at least 2 metres. The remote control contains electronic components. Protect the remote control from moisture, excessive vibration and direct sunlight. Unsuitable batteries can damage the remote control. Replace a discharged battery only with a new battery of the same voltage rating, size and specification. Discharged batteries must be disposed of in accordance with regulations governing the protection of the environment. The battery in the remote control may contain perchlorate. Please comply with legislation regarding disposal. Protect the remote control against inadvertent operation in order to prevent the auxiliary heater from being switched on unintentionally. a) The remote control is out of range. Move closer to the vehicle and press the corresponding button again.